Lithium is a precious metal whose resources are limited and localized in a few countries (Argentina, Chile, Bolivia, China) . Moreover, the use of lithium batteries is expected to increase dramatically in the future. Therefore, recycling of lithium from spent batteries will soon become a key process to enable the revolution of lithium battery applications. Unfortunately, current methods of lithium recycling and production are too expensive, complicated and lack enough selectivity towards lithium. We have recently developed a new method of lithium production and recycling that is based on the use of battery materials (e.g. LiFePO4), which are advantageous because of their very high selectivity towards lithium ions. The materials are used in combination with reducing and oxidizing agents (eg. thiosulfate or persulfate) to drive the insertion and extraction of lithium ions into the battery material. 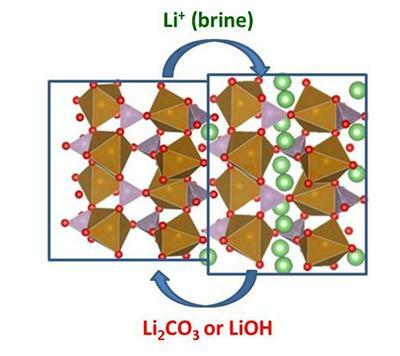 The method has been proven successful to selectively extract lithium from natural brines, where the concentration of other ions (eg. sodium and magnesium) is much higher than that of lithium. Once lithium is captured in the FePO4 host structure, it can then be released in a concentrated solution using an oxidizing agent, in order to obtain a lithium salt (eg. Li2CO3, LiOH, Li2SO4) as the final reaction product. In this way, the FePO4 structure could be recycled and used many times. Alternatively, the LiFePO4 product can be used directly in a battery, with a performance that is comparable to a commercial product.